So last week I walked in and found a rather unusual sight. My Barbie shelf is in my office and sits about about a foot from the door jamb. It's really hard to run into it actually because it's not that deep and doesn't stick out in the room too much. But I'm telling you. There is NO way all this could have happened without someone running into it. I'm thinking either the hubby or I were sleepwalking (which I have been known to do in the past) or an earthquake. At the edge of the shelf on the very end I have Splash n' Color Kira. 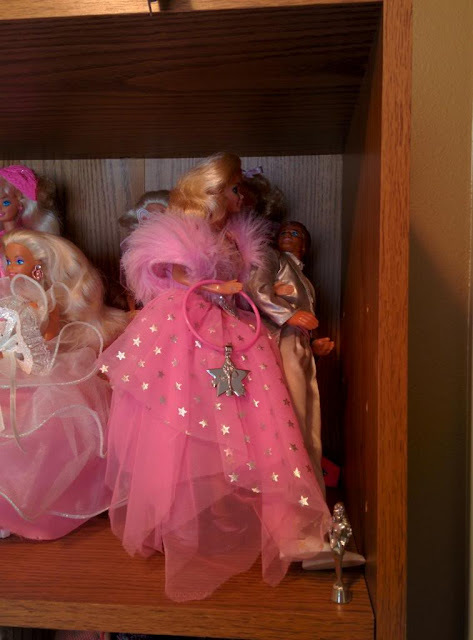 Next to her (moving toward the inside of the shelf) is my Really Rosy Kayla. The only thing I can think of is that Kayla fell over knocking down Kira then tumbling to the bottom below where I have Stacy, and my Easter Bunny Fun Barbie. Stacy must have been knocked off balance at the very end. I have had the Kayla in the same spot for over 2 years. Wonder why she just NOW decided to fall over! 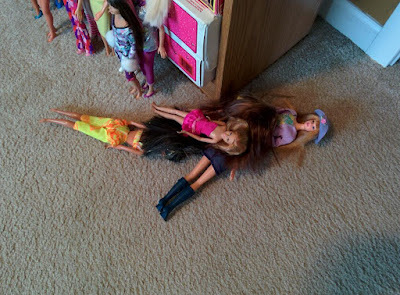 Leaning Tower of Barbies. This however is nothing new but for some reason ALL of them seemed to be tipped over rather than just one or two. I have no idea how to get them to keep upright. They don't have shoes on, you'd think their vinyl feet would be just "sticky" enough to keep them planted. Guess not! Then when I thought it couldn't get any worse, I look up to the top shelf to see Superstar Ken has taken a tumble backwards. Good thing Barbie was holding onto him! All are back in their spots and upright now. And I did have to share this display as well. 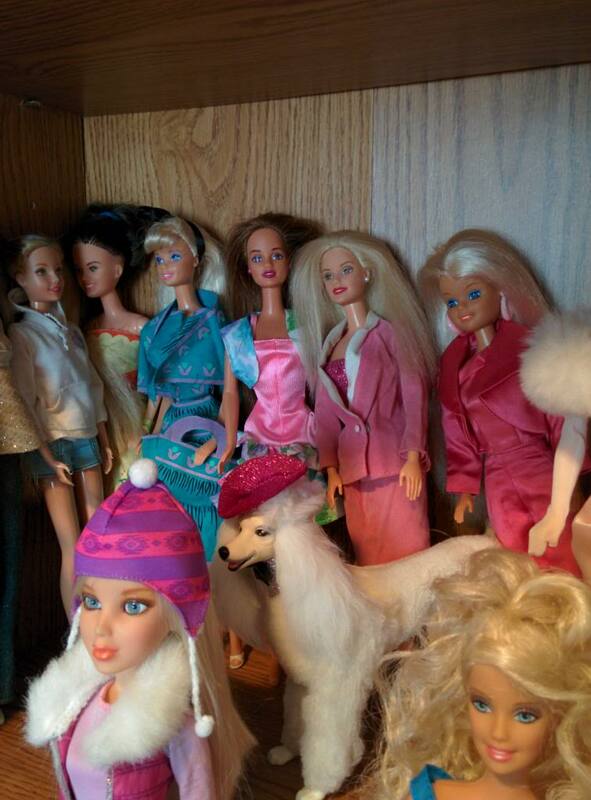 To the left of the shelf is a TV stand where I have the most beautiful Fashion Photo PJ with my collection of vintage Barbie Hallmark ornaments. LOVE. 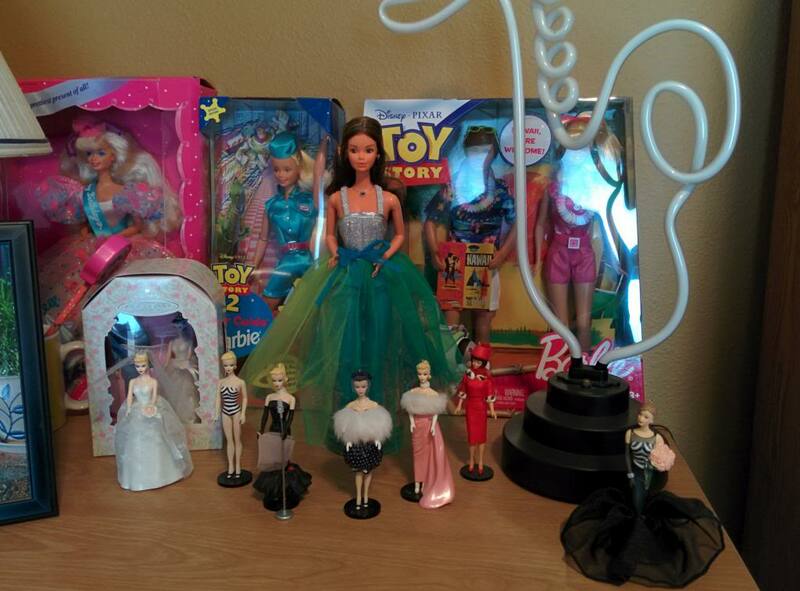 The little white box to PJ's left is a Barbie and Ken wedding day ornament set. 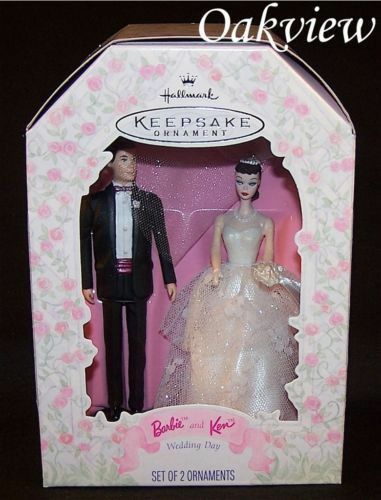 I have the single blonde ponytail doll ornament in front and in the box is a beautiful brunette ponytail ornament along with Ken. 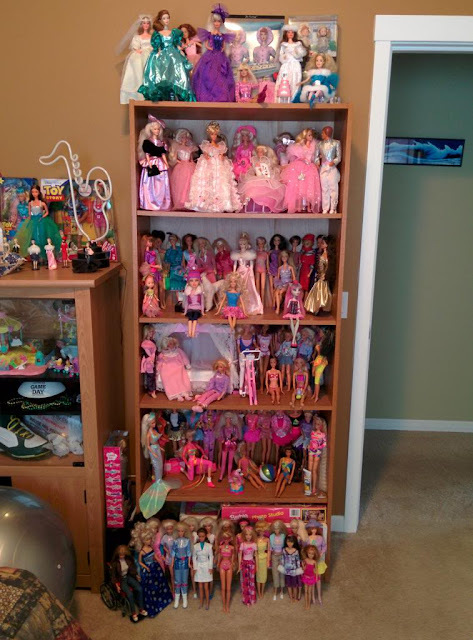 So readers, show me your awesome dolly displays! I would love to see them. Mine is by no means the best or most organized that's for sure. But it was the only shelf I had at the time so I will make do. But when I build my new house I will have an entire office dedicated to my awesome collection! Can't wait! But yes, post pics in the comments! 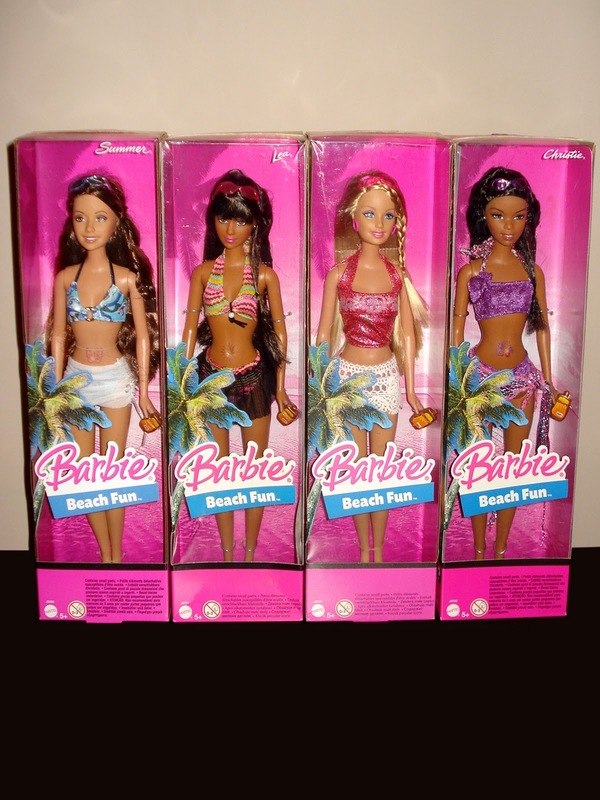 The 2005 Beach Fun Barbie! Not really a whole lot to this doll. I got her about the time I started this blog. She was in nice condition so I kept her on my shelf. The perfect braid in her hair and the still "on" toenail polish tells me she was not played with a whole lot. And loving the cute little tankini! 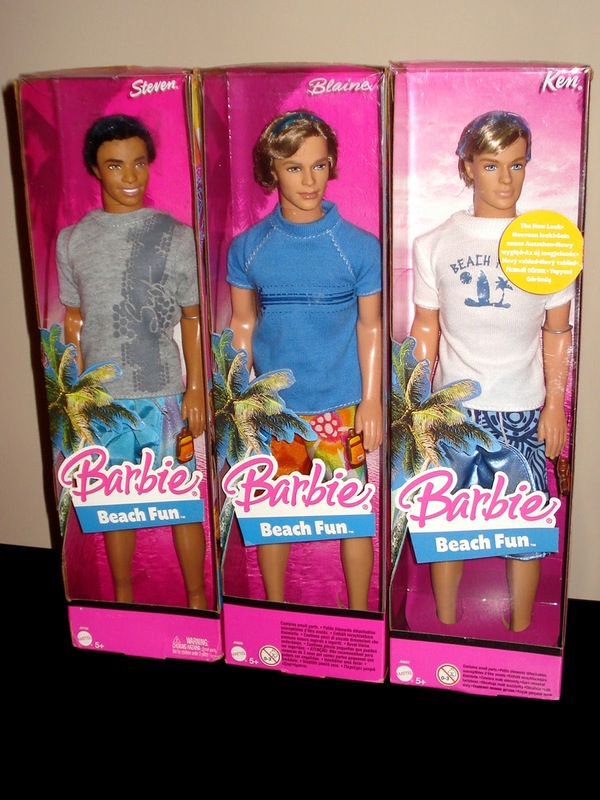 In addition to Barbie there were Summer, Lea, and Christie. And dudes Steven, Blaine, and Ken. Do you have any of the Beach Fun collection? Let me know! I am ashamed to say that I have NOT been working on the Benny doll project. I guess i'm feeling a little uninspired right now! But I have been working on knitting a scarf that I started 9 years ago. (Yeah, I know...... I just get inspired NOW to finish it??) So needless to say if I continue to be inspired to knit I will have it done just in time to look at it for a few months until winter rolls around again. ha! Next time I post I will be featuring some fun dollies I hope you will all enjoy. Until then! Oh Wow! Just found your blog! I'm in love with your work! Its nice to see your display! I don't really display any of mine at the moment. Maybe one day. I LOVE the Beach Fun dolls, such a good line. Of course, I am after the Kayla from this line, as I don't have her yet - I also really like the Blaine. I wonder what kind of wild party was going on in that shelf? 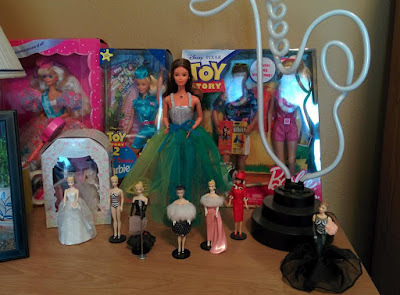 Having a constant lack of doll stands, I found mine in weird socializing positions as well a couple of times. They sure have fun, when their human leaves the room. I wish you a belatet Happy Easter! My dollroom is still a hot mess with storage boxes in front of the cabinets, waiting for the hubster, to get the walls done and some more shelves and cabinets installed. I love the beach dolls in spite of their bigfoot-feet. P.J. 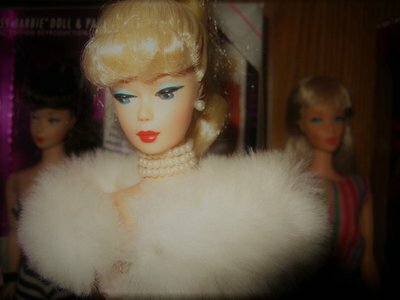 is one of the most beautiful dolls of her time. Thank you Fss! Awesome you stopped by. Hope to hear from you again soon! Andrea - I know, some wild party! Reminds me of Toy Story when they all run back to their original positions so their owners don't know they have been playing around. My Barbies did not do such a good job of that. :) I would love to see your display once the shelves get put up! The only thing I like about the bigfoot feet is that they created some super cute flip flops for them. And yes, one of the most beautiful PJ's. I just love her. 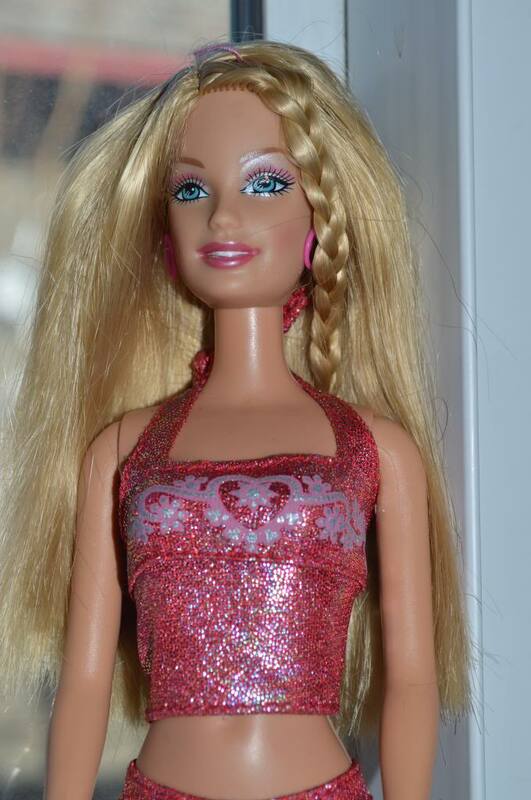 I have the Christie Beach Fun doll and she is simply beautiful. She only came with her top as I got her from Goodwill and the rest is missing of her ensemble. So glad to have her though. She is a great addition to my collection. You are right Katilyn, I don't think there can be a bad Christie. They all are beautiful. This one especially though. Gorgeous!